Home » Don Mancini Ready to Shoot Seventh Child’s Play Film, Hints Jennifer Tilley Will Feature! Don Mancini Ready to Shoot Seventh Child’s Play Film, Hints Jennifer Tilley Will Feature! About a year ago, Don Mancini confirmed that he was working on a script for the seventh film in the Child’s Play franchise but we haven’t heard much about since then. Well, yesterday, Mancini and Jennifer Tilley engaged in a witty Twitter exchange about the long-rumored seventh installment in the Child’s Play series. 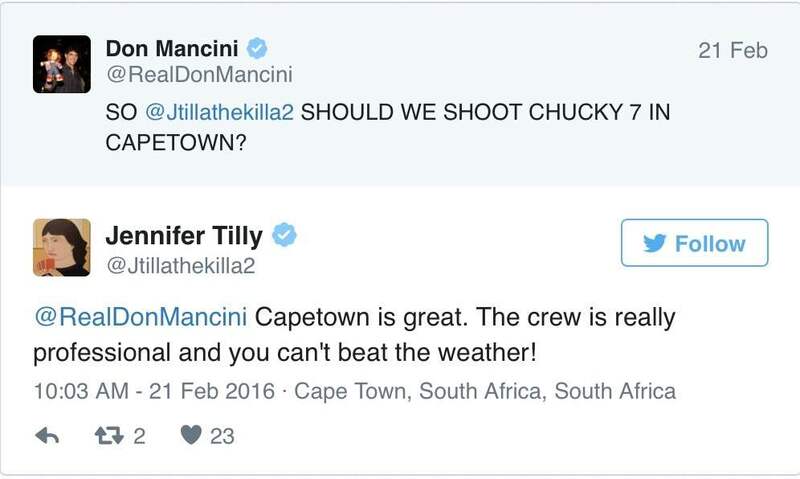 Mancini Tweeted at Tilly asking if they should shoot the seventh installment in the series in Cape Town and Tilly responded by saying noting that the crews there are professional and you can’t beat the weather. This seems to suggest that the film may be in the early stages of preproduction and that Mancini will be directing with Tilley reprising her role as Tiffany, in some capacity. Also worthy of note is the fact that Universal Home Entertainment has been know to shoot in South Africa. For example, the distributor lensed at least one Death Race sequel there. Stay tuned to the site in the coming months for the latest horror news as well as more about this project as we learn it! The most recent installment in the series, Curse of Chucky sees the return of the indestructible killer doll that is possessed by the spirit of Charles Lee Ray. In this installment, Chucky sets his sights on a young, wheelchair-bound woman named Nica. Chuck arrives at her home and immediately begins making trouble for the nice young lady. Mysterious deaths start to occur all around her and Nica comes to suspect that the doll that recently arrived on her doorstep may be to blame. No word just yet on where the seventh film will take things. Previous ArticleIs Relativity Pulling the Plug on The Strangers 2?Next ArticleZombieland 2 Refuses to Die: Here is an Update! Have Horror Movies made you Automatonophobic?